Headlines > News > Chaotically Magnetized Cloud Is No Place to Build a Star, or Is It? Cambridge, MA – For decades, scientists believed that the magnetic field lines coursing around newly forming stars were both powerful and unyielding, working like jail bars to corral star-forming material. More recently, astronomers have found tantalizing evidence that large-scale turbulence far from a nascent star can drag magnetic fields around at will. 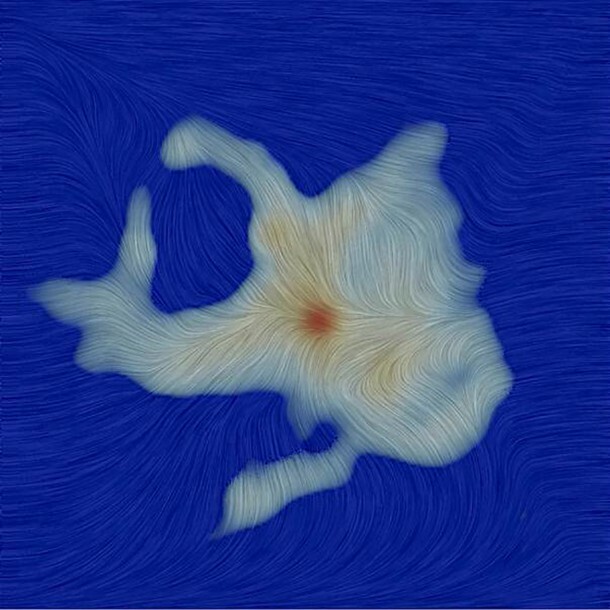 Now, a team of astronomers using the Atacama Large Millimeter/submillimeter Array (ALMA) has discovered a surprisingly weak and wildly disorganized magnetic field very near a newly emerging protostar. These observations suggest that the impact of a magnetic field on star formation is more complex than previously thought. The researchers used ALMA to map the magnetic field surrounding the young protostar dubbed Ser-emb 8, which resides about 1,420 light-years away in the Serpens star-forming region. These new observations are the most sensitive ever made of the small-scale magnetic fields surrounding a young protostar. They also provide important insights into the formation of low-mass stars like our own sun. 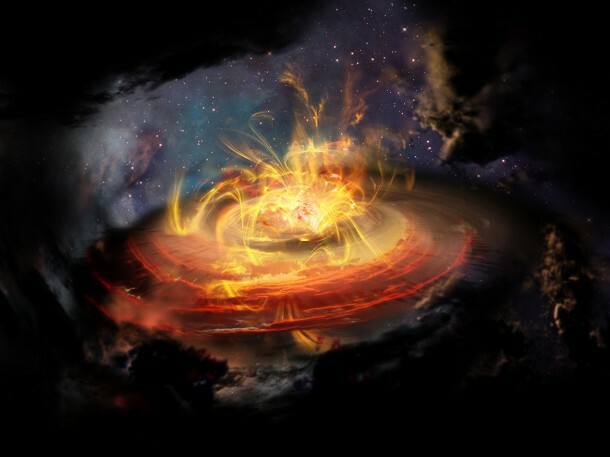 Previous observations with other telescopes found that magnetic fields surrounding some young protostars form a classic “hourglass” shape – a hallmark of a strong magnetic field – that starts near the protostar and extends many light-years into the surrounding cloud of dust and gas. ALMA is able to study magnetic fields at the small scales inside star-forming clumps by mapping the polarization of light emitted by dust grains that have aligned themselves with magnetic fields. By comparing the structure of the magnetic field in the observations with cutting-edge supercomputer simulations on multiple scales, the astronomers gained important insights into the earliest stages of magnetized star formation. The simulations – which extend from a relatively nearby 140 astronomical units from the protostar (about four times the distance from the sun to Pluto) to as far out as 15 light-years – were performed by CfA astronomers Philip Mocz and Blakesley Burkhart, who are co-authors on the paper. In the case of Ser-emb 8, the astronomers believe they have captured the original magnetic field around the star “red handed,” before outflowing material from the star could erase the pristine signature of the magnetic field in the surrounding molecular cloud, noted Mocz. This research was presented in a paper titled “Unveiling the Role of the Magnetic Field at the Smallest Scales of Star Formation,” by C. Hull et al., appearing in the Astrophysical Journal Letters. Atacama Large Millimeter/submillimeter Array (ALMA), an international astronomy facility, is a partnership of ESO, the U.S. National Science Foundation (NSF) and the National Institutes of Natural Sciences (NINS) of Japan in cooperation with the Republic of Chile. ALMA is funded by ESO on behalf of its Member States, by NSF in cooperation with the National Research Council of Canada (NRC) and the National Science Council of Taiwan (NSC) and by NINS in cooperation with the Academia Sinica (AS) in Taiwan and the Korea Astronomy and Space Science Institute (KASI).